7 Jul 2017 7-14 July. The third summer school will focus in the development of business plans based in exploitation of the the results of design-led research. 12 Feb 2017 5-10 May 2017. This research course will explore the dynamic and interactive qualities of textiles and how these relate to ways of being and living. Agenda and more information. 22 Nov 2016 Midterm meeting with the European Commission. 21 Nov 2016 Midterm meeting with the European Commission. 1 Sep 2016 During autumn 2016 all the researchers are doing their first periode of secondments. They will work at other schools in the network, working on development projects to exploit the maximum potential of professional and complementary skills and network-wide training. For more details and schedule, se page 16-17 in the PhD-guide. 23 Jul 2016 ESOF, Euro Science Open Forum is the largest European science conference gathering world famous researchers and scientists from all disciplines. It takes place every two years, next time it will be held in Manchester 23-27 July. The PhD students in the ArcInTexETN will participate. More information about ESOF on their website. 15 Jul 2016 The ArcInTexETN Summer School No. 2: Research entrepreneurship in the academic and non academic area will take place at The Royal College of Art in London, July 15-22. The PhD students will collaborate within the theme Innovative business ideas based on individual design. Click here to download the program (pdf). 29 Apr 2016 The world’s first hackathon on fashion and tech is taking place in Berlin 29th of April to 1st of May. Within 48h the international avant garde of design and technology will be working interdisciplinary on the future topic of digital fashion. Accompanied by partners from media, science and industry groundbreaking concepts will be developed, which are indicating already today how futureâ€™s fashion will satisfy the newly needs of a digital society. The originated showcase prototypes will be publicly set in scene in a fashion show with a wide media audience. More information (pdf). 18 Apr 2016 The ArcInTexETN Workshop No. 1 Professional skills training will take place at University of Technology in Eindhoven, April 18-20. Read more about the workshop. 28 Feb 2016 Sunday, 28th of February Place: Hardenbergstrasse 333, room 310 (3rd floor), 10623 Berlin In the context of the ArcInTexETN research programme, the Chair for Digital and Experimental Design (Prof. Dr. Norbert Palz) at Berlin University of the Arts is cordially inviting you to the international symposium. Click here to download the program (PDF). 22 Feb 2016 This research course on textile architecture will discuss the role of textiles in architectural design, with a dual focus on spatial and structural implications. Deliverables: papers on theoretical viewpoints within the field and mapping the research practice of the ESRs themselves into this field; and oral presentation in front of peers. Read more about the course. 21 Sep 2015 This is the first Summer School for ArcInTexETN. It took place in Berlin and during two weeks all of the PhD students and Supervisors met, learnt and created in workshops. Full program for the Summer School in Berlin (PDF). 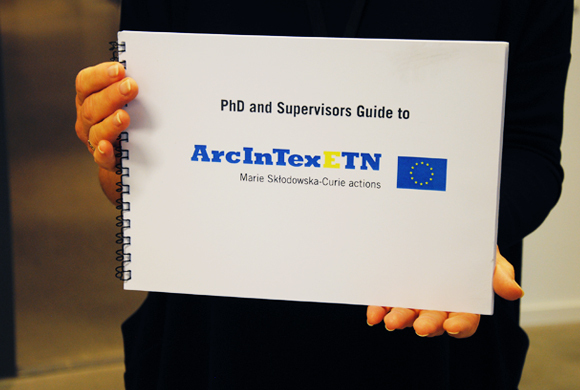 21 Jan 2015 For three days the members of ArcInTexETN met at the Royal College of Art in London to discuss the content of the network and the recruitment of new PhD-students. Below you can see some glimpses from the KickOff.